Environmental awareness is built into Claber products at the design stage. The quality of selected materials ensures a long life cycle, which in turn reduces the amount of waste generated by consumers. 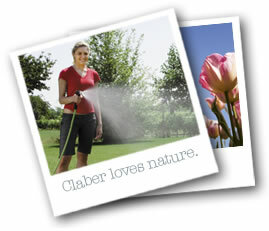 Home irrigation systems using Claber products are guaranteed to save precious water, in every area and situation: garden, patio or balcony, house plants, vegetable plot… everywhere and anywhere. And thanks to the technologies employed, Claber automatic irrigation systems also help to reduce electrical power consumption.